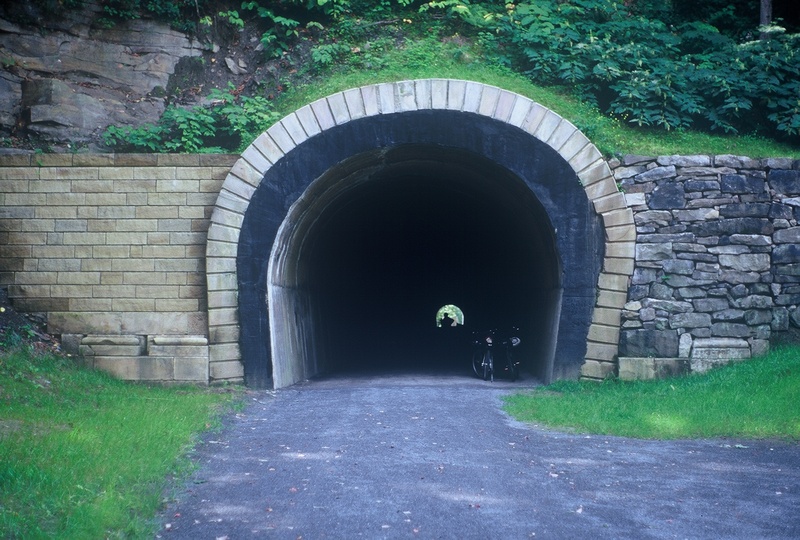 The Staple Bend Tunnel Trail follows the path of the Allegheny Portage Railroad to the first railroad tunnel in the country, the 901 foot long Staple Bend Tunnel. The railroad, an engineering landmark, lifted canal boats over the Allegheny Mountains in the 1830's, 40's and 50's. This trail, Managed by the National Park Service, allows the visitor to walk or bike to the nation's first railroad tunnel. Take US Route 22 to the Mundy's Corner/Nanty Glo exit. Turn right onto PA Route 271 South. Continue on Route 271 South approximately 5 miles until a (marked) left turn onto Mineral Point Road (PA 3030). After approximately 2 miles make a (marked) right turn onto Beech Hill Road and proceed over the bridge. Go through the railroad underpass (wait for the green light! ); the paved parking lot for Staple Bend Tunnel will be located on the right. Please used the parking lot and do not block the emergency access road. This same parking area is used for the Path of the Flood trail as well. Included as part of the Path of the Flood NRT, the Staple Bend Tunnel trail is one segment of the Pittsburgh to Harrisburg Main Line Canal Greenway. The trail has two surfaces which will serve two populations. The 2.5 mile trail is level with a limestone surface that caters to recreational exercise. The trail also is the only access to the Staple Bend Tunnel, a unique tunnel with exemplary stone masonry and exposed rock. This trail has several features that set it apart from any rail trail in the world. First and foremost is Staple Bend Tunnel, the first railroad tunnel completed in America. It was the third tunnel of any kind built in the U.S., the first tunnels were for other canals in Pennsylvania. Work began on the tunnel on November 21, 1831 and often occurred during inclement conditions. The men were paid $13 per month plus room and board for 12 hour days 6 days per week. Workers chipped and blasted 901 feet of solid rock to make the tunnel. The tunnel grew about 18 inches each day, with both sides moving toward the center. On December 21, 1832 the workmen broke through the final barrier and connected the two ends of the tunnel. There was much celebration with speeches and toasts. The full tunnel excavation was completed in April 1833. The ends of the Staple Bend Tunnel were lined with cut stone for safety. Rock and dirt might fall due to rain or other weather, or from the effects of the portage railroad going through the tunnel. The fancy entrance ways to the tunnel were to impress the travelers and the general public. The style was described as a "Roman Revival style with low relief lintel supported by Doric pilasters on each side." Of the money spent (the total cost was $37,498.85), nearly half was to build the entrance ways. The mark (signature) from the early 19th century stonecutters can still be seen on several blocks (bring a flashlight). The rest of the tunnel is natural bare rock. Along the trail are several rows of existing stone “sleepers” used as railroad ties in the 1800's. Once through the tunnel, you are standing at the top of the first of a series of 10 inclines used to transport canal boats loaded on rail cars across the Allegheny Mountains, connecting Philadelphia and Pittsburgh and beyond. The Staple Bend Tunnel Trail is part of a larger trail system known as the “Path of the Flood Trail,” which follows the route of the 1889 Johnstown Flood from South Fork to Johnstown along the Little Conemaugh River. Eastern portal of the Staple Bend Tunnel. Western portal of the Staple Bend Tunnel.